L'amuse bouche - this came in two parts. Sweet corn velouté - this was OK, with a sprinkle of what I assumed to be piment d'espelette powder on top. L'huître: oyster served over lemon granitée and Champagne sabayon - these Fine de Claire oysters came with both an acidic lemon granité as well as a creamy Champagne sabayon. This was nice and well thought-out, as the richness of the cream and the acidity neutralized the briny flavors of the oysters, and also prevented the accompanying Champagne from bringing out and highlighting those briny flavors. Mumm Blanc de Blancs Mumm de Cramant - very nice mousse, pretty light, elegant, and rounded on the palate. A little toasty. Also a little ripe on the palate but not too much. "Small" production of around 4 to 5,000 cases annually. This wine was originally a private cuvée of the house and not released for sale. The distinctive label harks back to the days when the bottles were only given to friends, along with a business card folded at one corner - to indicate that the wine was delivered in person. L'asperge: classic steamed white asparagus with Hollandaise sauce - it's still asparagus season, so it's not surprising that this came up on the menu. This, of course, works wonderfully well with Champagne. We also have cured salmon with chunks of ham, as well as cucumber ribbons. Then comes the main event: the trio of magnums being launched. Each magnum bears the chef de caves' signature as well as the date of disgorgement. 1996 Mumm Collection du Chef de Caves, en magnum - nice acidity here, which was a little focused but not quite to the point of sharpness. A very precise wine, with a very nice balance. A little caramel on the nose. Slight bitterness on the finish, but otherwise very round on the palate. Sweetness on the palate came out when paired with the salmon. What a beautiful wine with tons of potential. Le vol au vent: Bresse chicken facon blanquette with seasonal mushrooms - I had a problem with this dish the minute I read the description. Why would anyone take something as fine as Bresse chicken, chop it up and make vol au vent with it?! Well, I was right. My palate certainly wasn't sophisticated enough to distinguish between the cubes of chicken inside the puff pastry and the chilled chicken from any supermarket. Especially when the chicken was overcooked and no longer tender. And the vol au vent was only OK. The catered version at the Mouton-Rothschild dinner earlier in the year was much, much better. 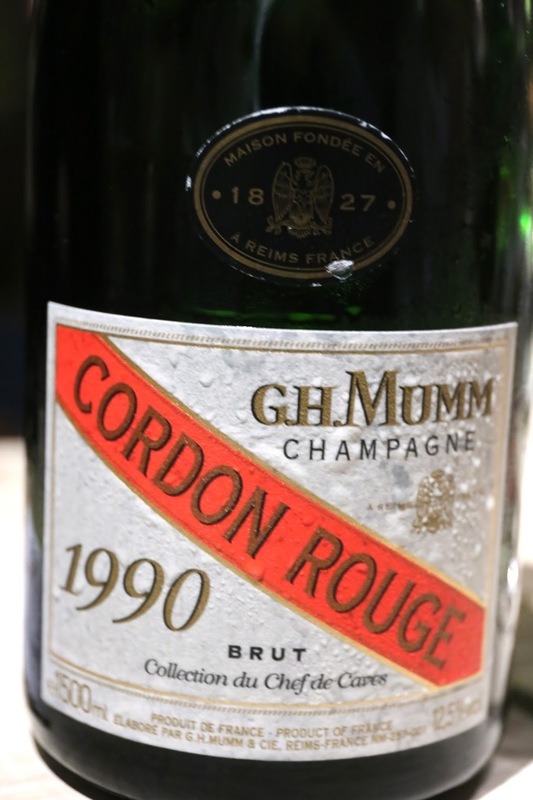 1990 Mumm Collection du Chef de Caves, en magnum - a mature wine, with very little bubbles. Ripe on the palate, with marmalade notes. Great depth of flavors here, with a really long finish. Beautiful! La caille: pan-fried Brittany quail, gratin dauphinois, apricot glaze and coffee emulsion - the quail was OK, but I would have preferred it be much more pink. Gotta say that the coffee emulsion was pretty interesting. 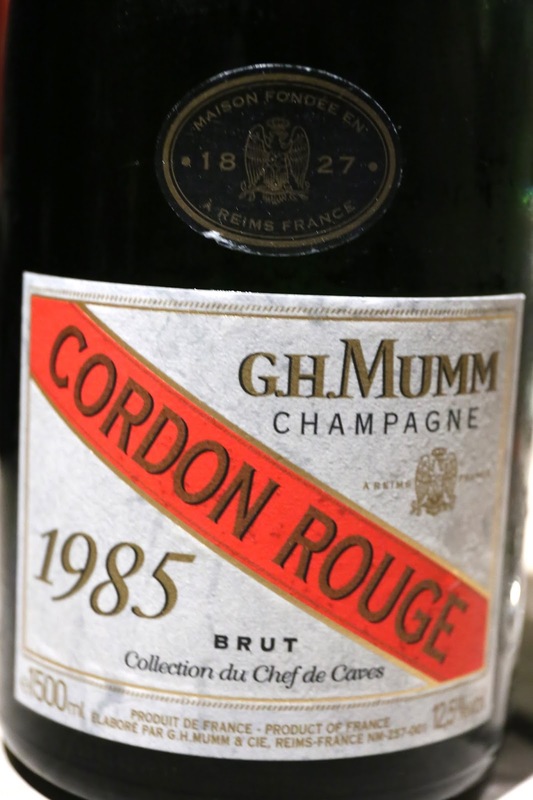 1985 Mumm Collection du Chef de Caves, en magnum - first whiff of the wine and I said to my neighbor : "This is why I love Champagne!" 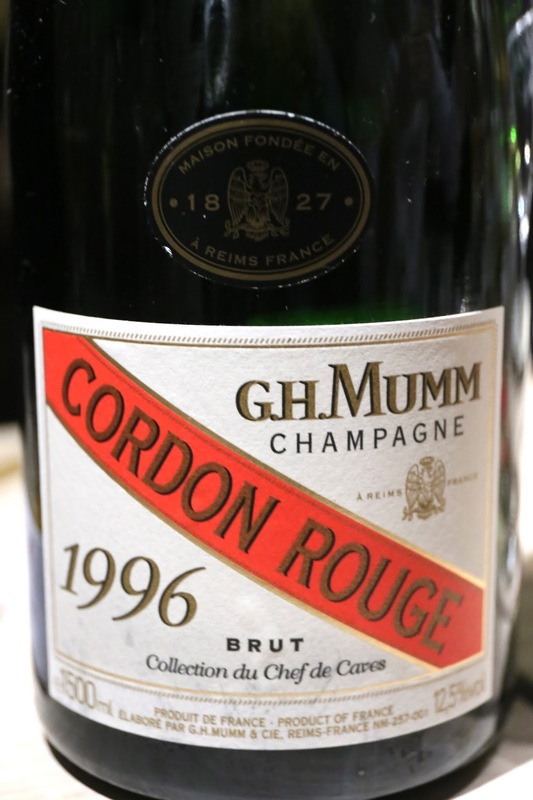 A fully-mature Champagne, with classic salty plum (話梅), minerals, and caramelized nose. Still very much alive and fresh for a Champagne this age, thanks to the recent disgorgement. An incredibly beautiful wine! La framboise-pistache: ivory crémeux, pistachio cream, fresh raspberry and lemon sorbet - this was very tasty. 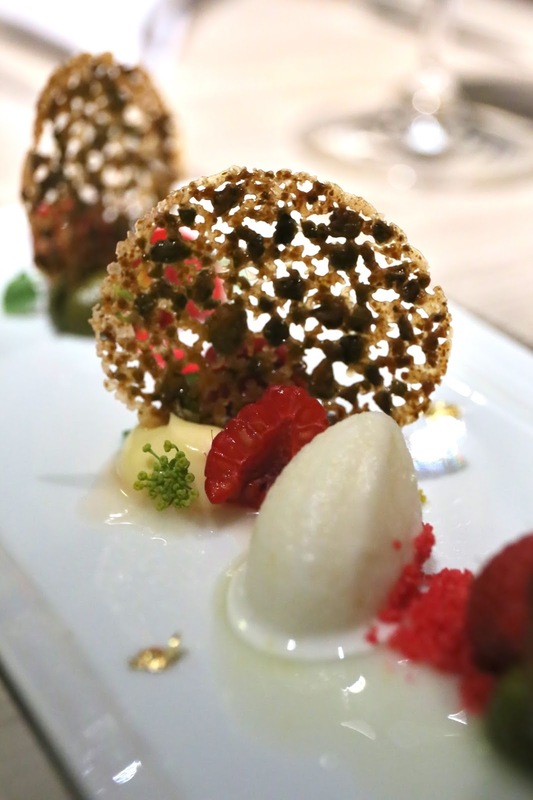 Three pistachio tuiles are lodged in dollops of crémeux, accompanied with raspberries and raspberry granité, accompanied by lemon sorbet and garnished with dill flowers. Lovely combination of acidity and sugar sweetness, as well as a contrast of textures. Mumm Le Rose - nose of strawberries. 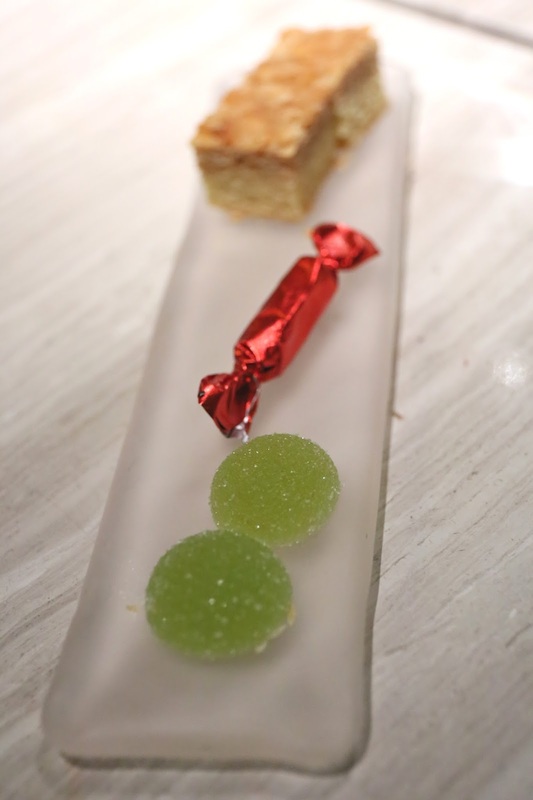 Les mignardises - green apple gelée, caramel vanilla toffee, and almond cubes. Our hosts were friendly with the owner of the restaurant, and he very generously shared some L'Or de Jean Martell with each of us. This is a pretty exclusive Cognac blended from over 400 eaux-de-vie... with a street price of a few thousand U.S. Dollars. I don't normally drink Cognac, but I wasn't about to be rude and pass up this rare tipple. Nose was floral, sweet with caramel notes. This was much smoother than I expected. A beautiful Cognac.